The goals of CMI are to (1) provide students as a whole with more affordable course materials, (2) enhance the students’ experience on a common digital platform via Blackboard, and (3) position UMBC to be ahead of the curve with digital content. Negotiations were conducted directly with publishers to provide students with reduced pricing. Students enrolled in courses using CMI have had a course materials charge included on their tuition bill. Students can access the digital textbook and any publisher integrations (such as Aleks or WebAssign) directly via Blackboard with enhanced features such as highlighting, note taking and assistive technologies. Once you download the Bookshelf app, you can download your eBook to any of your mobile devices and access it anywhere – even without a connection! For a one page student summary click here. To download the CMI Student Handbook click here. We are pleased to announce that this initiative has the SGA’s full endorsement. To view the Senate Resolution, click here. 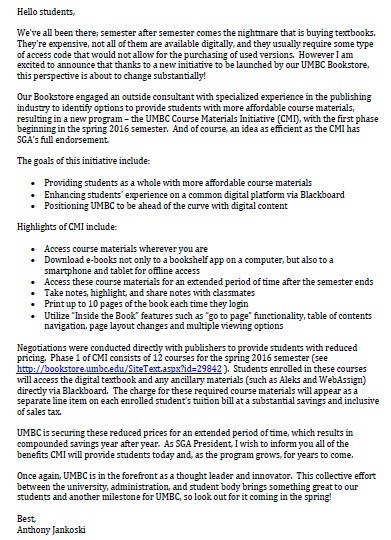 For more information regarding the UMBC Affordable Course Materials Initiative Policy and Consent for CMI Removal Form please click here. VitalSource is the leading platform for textbook e-readers, and the Bookshelf has many functionality features. You can download the text for offline reading and create folders and collections to stay organized. Navigate through the table of contents to jump between sections or search for the content you are looking to review. Print only the pages you need, change the page layout with multiple viewing options, and pick up at the last page you were reading. The Bookshelf also allows copy/paste, note-taking, and highlighting of the text, which you can then share with a friend or print for open-note quizzes! The UMBC Bookstore has five print copies of each course material at the AOK Library's Circulation Desk. Students may check out a copy for three hours at a time. If no other student is waiting to use the same material, the copy may be checked out for another three hours. These copies may not be removed from the library for any reason. Which courses are part of CMI? in is part of CMI? You will know when you register for the course. The following message will be displayed: "This course is part of the UMBC Course Materials Initiative in which reduced pricing was negotiated directly with the publisher for all students enrolling in this course. The course materials are provided in a common digital platform to all students; a maximum course materials charge of $____ will be included on all students’ tuition bills for these materials (so students are not to buy these materials from any other source). The digital textbook and any online publisher integrations associated with your instructor-selected text are accessed directly via Blackboard. [Please note that your instructor may have additional materials required for your course that are not included in this Initiative, but which will be available in the UMBC Bookstore.]" What is a CMI extension course? A CMI extension course is a second or third semester course for which the first semester is a participating CMI course. This means that if a student has taken the first semester CMI course, they should still have access to their materials for the second and third semester. Any students that are entering the second and third semester without taking the first semester have the ability to OPT INTO CMI, by filling out the OPT IN Form and either returning it to the Bookstore or e-mailing it to textbook@umbc.edu by the semester's add/drop date. How much is this charge? The charge varies from class to class depending on the course materials required. What if I have a Book Loan or Scholarship? The CMI charge is automatically billed to your student account when you enroll in the course, and is paid like any other charge. Any excess financial aid loan or scholarship disbursements will also apply against open Course Material charges. How does CMI benefit the students? Access your course materials by the first day of class. Pay on your student bill, just like tuition. A course materials charge is included on all registered students’ tuition bill for the courses in this program. This allows you to use budget billing for your course materials! Access your course materials wherever and whenever. Once you download your digital book to your bookshelf app, you can access it anywhere – even without a connection! You can study using up to 4 devices; go from your desktop, to your laptop, to your iPad/ Kindle, to your Android/iPhone. Single sign-on. When you enroll in a CMI course, an ADA compliant, common digital format of your textbook and ancillaries, such as Aleks or WebAssign, automatically uploads onto your Blackboard account. There are two printing options available to students. The first option is to print up to ten pages per login at no other cost than the cost of paper and ink. 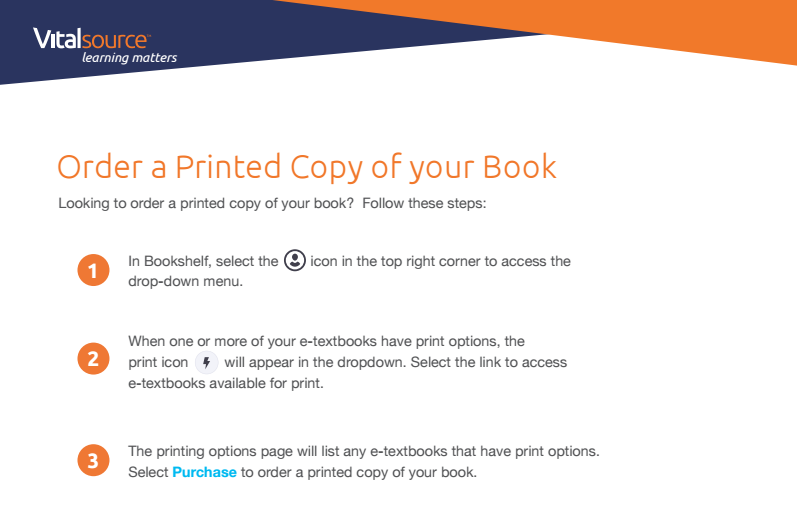 The second option is to purchase a print-on-demand copy from the publisher via VitalSource. Acceptable forms of payment are limited to debit cards and credit cards. In addition, the UMBC Bookstore has two print copies of each course material at the AOK Library's Circulation Desk. There is also an option to opt out. For the Textbook and online publisher integrations there is 24/7 online support. but end up dropping it? the allowed add/drop date, you will not be refunded, but you will be able to maintain access to the course materials through your VitalSource account. that is part of CMI? If in a previous semester you were enrolled in a course that is now part of the CMI, you will not need to pay for the same course materials, given your ancillaries have not expired yet. Please note, the length of online publisher integrations access varies from title to title. If you retake a course that was part of the CMI in both previous and current semesters, you will still have access to your eTextbook for a total of three years and ancillaries for one or two years, depending on the online publisher integration. Again, you will not need to pay for the same course materials for a second time. To remove the charge from your student billing account fill out the Consent for Removal Form and bring it to the Bookstore Textbook desk. Your course materials are located within your course on Blackboard. Once your professor activates the course, you will be able to access them. Your professor decides where in the course to place the link to the course materials – for example, this could be in the Syllabus or Course Documents content area. Click on a link to an eTextbook to access the digital resource. Your professor may choose to deep link to eTextbook chapters. Click on the links provided by your professor in the Blackboard course. Read the eTextbook after downloading the VitalSource App to your chosen device(s). Click on the My Blackboard dashboard and view your Bookshelf. Or once you have setup a VitalSource account, you can access your eTextbook directly through the VitalSource website. For more information on synchronizing your VitalSource account to your Blackboard account click here. For more information on the three ways you can access your course materials click here. For more Blackboard troubleshooting, click here. once the semester is over? You can log into VitalSource directly and access your course materials in your Bookshelf, which you would have created the first time you logged into your materials through Blackboard. For most publishers, as long as you download the App and the book for offline use you will have access to that title perpetually. various devices for offline use? You can download the Bookshelf app from here for Windows, Mac, iOS, Android, Kindle or any other device you may be using. Are these materials ADA compliant? What do students think of this program? The Student Government Association has been very supportive of CMI, and encouraged the Bookstore to proceed with the pilot program for Spring 2016. At that time, the then SGA President, Anthony Jankoski, provided the Bookstore with a letter of endorsement of CMI. In May, the SGA passed a resolution endorsing the CMI, which can be read here. In Spring 2016, the Bookstore sent out a survey to all CMI students, click here to review the results. In Fall 2016, the Bookstore sent out another survey to all CMI students, click here to review the results. In Spring 2017, the Bookstore sent out another survey to all CMI students, click here to review the results. In Fall 2017, the Bookstore sent out another survey to all CMI students, click here to review the results. Still have a question we didn't answer? If the Frequently Asked Questions did not resolve your issue please contact us. You will receive a 100% refund of the Course Materials charge if you drop the class on or before the final add/drop day, regardless of whether the course materials have been accessed. No refund will be issued after the final add/drop day. What is the Course Materials Initiative (CMI)? Students in a participating course/section are provided with their faculty selected course materials in a digital format (with print options available). The digital course materials include ebooks and ancillaries such as WebAssign, Aplia and ALEKS, if applicable, from publishers under contract with UMBC. The course materials are integrated into Blackboard, UMBC’s learning management system, via VitalSource (the common digital platform), for all courses and sections participating. A course materials charge is included on the student bill when they have registered for a participating course. As public pressure continues to mount about the challenges of college costs, federal, state and the USM Board of Regents have enacted laws and policies to specifically reduce the cost of textbooks. The various laws and policies encourage exploring more options for lower cost course materials, including digital materials. UMBC’s Bookstore has tried various options, including textbook rentals, developing a textbook buying guide, and collaborating with faculty for timely textbook adoption, with limited success in reducing costs significantly. CMI was identified as a path to make greater reductions in course material costs. It is intended to provide a broader group of students with cost savings ranging from 15 to 55%, depending on the textbooks and ancillary materials selected with an average savings of 34%. There is also a sense that digital content is the direction the course materials providers are heading, as well as some Maryland public school systems, and it would be helpful to be ahead of that curve. Based on faculty textbook adoptions, the Bookstore with its consultant, identifies the price per the contracts with the publishers to identify those courses with potential for savings to students. Once the draft list of courses is compiled, Bookstore staff contact the applicable Program Directors/Coordinators and individual faculty members to ask if they choose to have their course participate in CMI; based on the faculty decisions, the list of courses participating in CMI is finalized. Orientation for faculty is offered through the Division of Information Technology on the use and available functionality features of the digital platform; a faculty orientation video is available here. Any faculty member who is interested in his/her course(s) participating in CMI, can send an email directly to Bob Somers. All students registering for those courses will receive direct communication about the CMI program; and, CMI information is incorporated in the registration materials including course descriptions in PeopleSoft. Students also have a choice of whether to obtain their course materials via CMI or from another source; students have until the end of the add/drop period to make their decision. Students access them via single sign-in on Blackboard, which includes a link to VitalSource’s bookshelf. Students can download their e-books to their computer, as well as multiple devices for off-line access. The agreements with publishers gives students access to their e-textbook for three years (3), and the ancillaries, such as Aleks or WebAssign, for 1 – 2 years, allowing for course retakes, and use of materials for connected next course segments. If, for any reason, a student encounters difficulty with their content, the Bookstore is available during business hours, and there is 24/7 on-line technical support available. If a student drops the class during UMBC’s add/drop period, the CMI charge will be refunded. If a student drops the class after the allowed add/drop date, they will not receive a refund, but will be able to maintain access to the course materials through their VitalSource account. A number of questions and concerns have been raised under this theme. First, charges for course materials provided through CMI are added to a student’s regular tuition and fee bill. Students may pay in the same ways they can pay their regular bills, including applying financial aid and scholarship funds to the charges. No sales tax is added for the materials, as digital content is exempt from Maryland sales tax. Students have access to their e-textbook for three years, which provides for course retakes and for follow-on sequences that use the same textbook. Students also receive access to ancillary materials, like Aleks and WebAssign, for 1 to 2 years, depending on the individual providers. What if a student prefers a physical textbook? There are three print options available to students. The first option is to print up to ten pages per login, at no other cost than the cost of paper and ink. The second option is to purchase a print on demand copy from the publisher via VitalSource for an additional fee. Acceptable forms of payment are limited to debit cards and credit cards. The third option is print copies available for free on reserve in the UMBC library. Students also may opt out of CMI by completing a form at the Bookstore. They may then purchase their course materials from another source in any format available. In many cases the publishers can convert custom textbooks to the digital format. If this cannot be done, the course will not be included in CMI. Students can highlight, take notes, copy/paste and share notes. They also have “Inside the Book” features such as “go to page”, table of contents navigation, page layout changes and multiple viewing options. Assistive technology features include ability to have the book read to the student and changing font sizes. Functionality available to faculty includes ability to connect chapters to the syllabus, create highlights for the entire class, and obtain summary data on pages viewed, highlights, annotations, etc. What do students think about this program? The Student Government Association has been very supportive of CMI, and encouraged the Bookstore to proceed with the pilot program for Spring 2016. At that time, the then SGA President, Anthony Jankoski, provided the Bookstore with a letter of endorsement of CMI. An article in The Retriever Weekly on 3/7/16 noted some concerns with the CMI and concluded that students should be allowed to opt out. As noted above, beginning in Fall 2016, due to a change in federal law, students may opt out of CMI by completing a form at the Bookstore. They may then purchase their course materials in any format available. In May, the SGA passed a resolution endorsing the CMI, which can be read here. What do Faculty think about this program? In Fall 2016, the Bookstore sent out a survey to all Faculty participating in CMI, click here to review the results. In Spring 2017, the Bookstore sent out a survey to all Faculty participating in CMI, click here to review the results. In Fall 2017, the Bookstore sent out a survey to all Faculty participating in CMI, click here to review the results.